Maybe my fel­low pilots will read or hear about this, and decide to come for­ward as well. Final­ly, a mil­i­tary pilot steps for­ward and com­plete­ly blows the lid off the unlaw­ful and exceed­ing­ly destruc­tive Glob­al Chem­trail Pro­gram. What fol­lows is a video which puts forth a true sto­ry about a coura­geous pilot who has bro­ken ranks with his chem­trail­ing peers. In so doing he has risked his life and the life of his fam­i­ly. 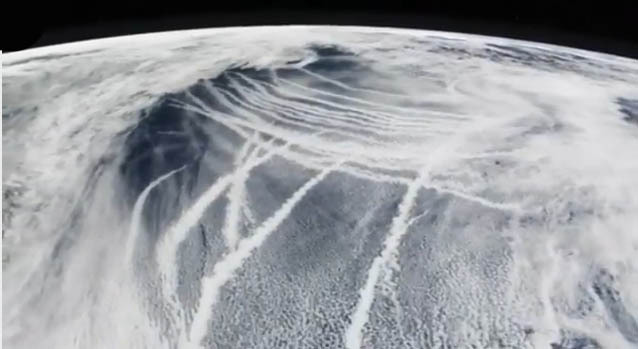 As you lis­ten to this pre­sen­ta­tion, or read the text pro­vid­ed below, bear in mind that chem­trails are being sprayed 24/7 around the globe with ter­ri­ble con­se­quences. 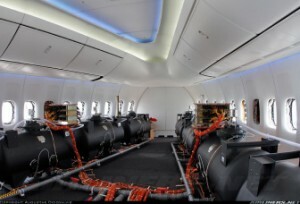 For those unini­ti­at­ed in the ways of atmos­pher­ic engi­neer­ing, chem­trails are but one geo­engi­neer­ing tech­nique that is being sys­tem­at­i­cal­ly used by the U.S. Mil­i­tary. 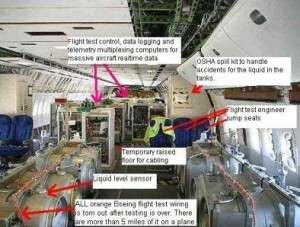 The fol­low­ing link pro­vides an excel­lent overview of the geoengineering/chem­trail phe­nom­e­non, as well as an excep­tion­al pho­to-doc. After all, only see­ing is believ­ing … for most peo­ple! 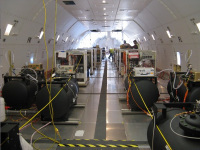 No mat­ter what the stat­ed rea­sons are giv­en to those who fly the chem­trail jets, they are always told by their supe­ri­ors that this ongo­ing and ille­gal atmos­phere-alter­ing pro­gram is being con­duct­ed in the inter­est of NATIONAL SECURITY. You’ll notice that NATIONAL SECURITY appears crooked because the whole inten­tion behind geo­engi­neer­ing is as dan­ger­ous­ly mis­guid­ed as it is decep­tive­ly false. The indis­crim­i­nate, wide-area and sys­tem­at­ic spray­ing of tox­ic aerosols through­out the skies of the world couldn’t pos­si­bly have any­thing to do with ‘nation­al secu­ri­ty’. Those that buy into such a ridicu­lous notion have obvi­ous­ly been either brain­washed or bribed into believ­ing such an absurd and non­sen­si­cal agen­da. That’s pre­cise­ly why this unprece­dent­ed exposé is so impor­tant. 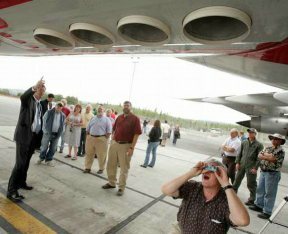 Nev­er before has any­one direct­ly involved with the pilot­ing of chem­trail air­lin­ers ever gone pub­lic. 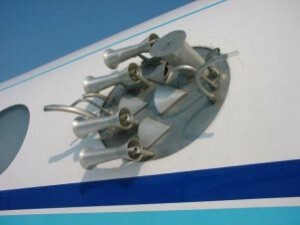 Not only does “Blue Jay 1”, as he is known, go pub­lic, he com­plete­ly blows the lid off of OPERATION INDIGO SKYFOLD. This sin­gle act of iden­ti­fy­ing the name of what is per­haps the most destruc­tive gov­ern­ment pro­gram in record­ed his­to­ry is extreme­ly crit­i­cal. Because it now gives the world­wide anti-geo­engi­neer­ing advo­ca­cy groups a tar­get to hit with­in their own nations and gov­ern­ments. 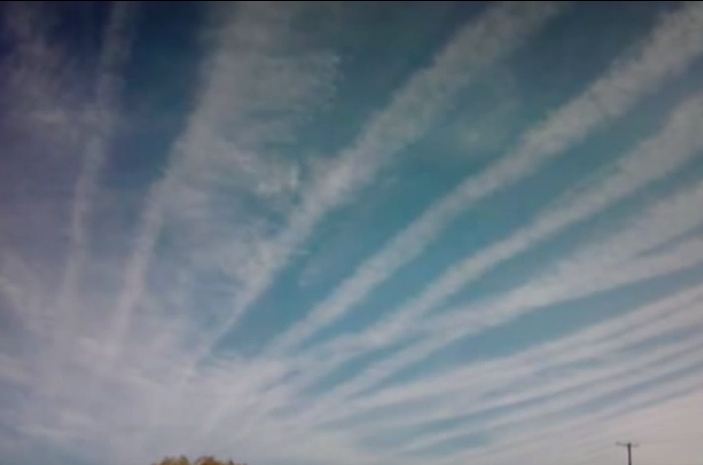 How, after all, could gov­ern­ment offi­cials and polit­i­cal lead­ers at every lev­el — fed­er­al, state, coun­ty and city — be so clue­less about a mas­sive aerosol spray­ing pro­gram that is going on in the skies right above them?! Can any respon­si­ble rep­re­sen­ta­tive con­tin­ue to plead such igno­rance or indif­fer­ence and get away with it? That’s why this crit­i­cal devel­op­ment is so huge! Real­ly HUGE! It is what we have all been wait­ing for, yet so few in the move­ment real­ly get it. Which is why this par­tic­u­lar mes­sage has to be tak­en to the wider pub­lic. Because at the end of the day — every day — every human being on every con­ti­nent will REALLY abhor two things about the now ubiq­ui­tous chem­trails. 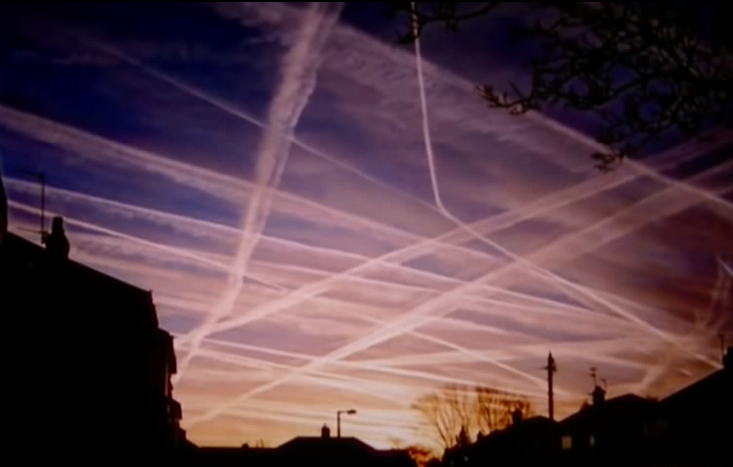 I. Chem­trails rou­tine­ly trans­form warm sun­ny days into cool cloudy ones. No one likes to see their clear sun­ny days stolen after a cou­ple of hours of chem­trail­ing. Day after day of over­cast skies have pro­found­ly changed many a locale which have tra­di­tion­al­ly expe­ri­enced clear skies. Is there any­one who prefers damp cloudy days to dry sun­ny ones? Cer­tain­ly the peo­ple of Flori­da and Cal­i­for­nia want their fun in the sun! So does the rest of the USA. II. 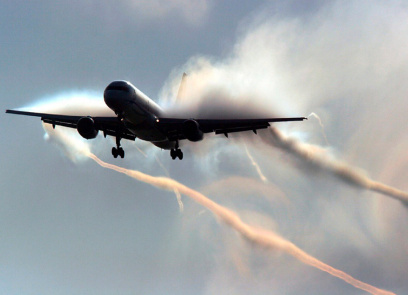 Chem­trails con­tain a mix of tox­ic chem­i­cals and poi­so­nous com­pounds such as bar­i­um salts, alu­minum oxide, stron­tium, mer­cury among many oth­ers, which even­tu­al­ly end up falling to Earth. The chem­trail mix of tox­ins inevitably leaves its residues on farm fields and forests, lakes and ponds, and lawns and gar­dens. How does one pos­si­bly stop the nox­ious chem­i­cals from enter­ing one’s home and auto­mo­biles, office build­ing and shop­ping malls? Who ever wants a tox­ic chem­trail brew dropped on them every oth­er day?! Geo­engi­neer­ing has proven — unequiv­o­cal­ly — to be extreme­ly detri­men­tal to both human health and the greater plan­e­tary envi­ron­ment. As for the many adverse health effects, the link below gives an excel­lent sum­ma­ry. For those who did not watch the video shown above, the most impor­tant text is pro­vid­ed below. Infor­ma­tion below was received by the cousin of an actu­al pilot who flies chem­trail jets and is work­ing on the inside. 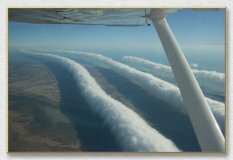 The oper­a­tion is known to pilots and avi­a­tion crew alike as ‘Indi­go Sky­fold’. 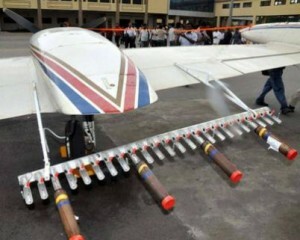 Pilots are told to fly spe­cif­ic routes, while satel­lites con­trol aerosol dis­per­sal pat­terns. The pilots make course cor­rec­tions from time to time, and per­form land­ings and take­offs. Pilot nav­i­ga­tion and main­te­nance crews are rotat­ed con­stant­ly, and only spend about 18 months at one giv­en base, to keep pilots and their fam­i­lies from mak­ing too many friends, and end­ing up with “loose lips”. 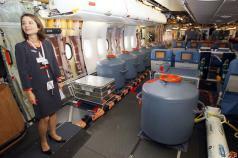 They also rotate between day and night flights, one base for day­time flights, and one for night. Each base cov­ers a 250-mile zone, and each fleet (squadron) of planes cov­ers three states, or an even larg­er swath of ocean. Their supe­ri­ors tell them it’s a mat­ter of Nation­al Secu­ri­ty. Sounds more like a PR state­ment to me. I think this pilot, either believes what he is told. Or, he is sim­ply try­ing to sug­ar coat their Geno­cide Project. My fire­wall detect­ed mul­ti­ple intru­sion attempts when I googled the Indi­go code as well. Zero info to be found on the inter­net for this oper­a­tion. That is unique. “First of all I would like to say that I do not agree with my mis­sion assign­ments, but what sol­dier ever tru­ly does? Sev­er­al of us have con­sid­ered buck­ing the ranks, and going AWOL from time to time. We are kept in the dark when it comes to get­ting hon­est answers about what we are real­ly spray­ing. Should they dis­cov­er that we or our fam­i­lies are active­ly enquir­ing about the so-called ‘chem­trails’ term, then auto­mat­ic and swift dis­ci­pli­nary action would be tak­en. 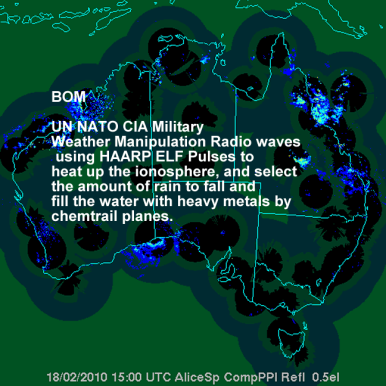 HAARP and radar are two oth­er non-allowed research sub­jects. Unless our chil­dren are learn­ing about these in base schools, we can­not edu­cate our­selves or our chil­dren through any pub­lic edu­ca­tion sys­tem. 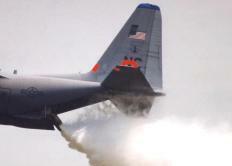 I would not inten­tion­al­ly spray my chil­dren or fam­i­ly with tox­ic aerosols, but as you must know, per­haps 80% of the pilots do not have any fam­i­ly or chil­dren. Indi­go pilots are cho­sen from top ranks with­in the Air Force, Navy, and Coast Guard. Most of the pilots are ‘hard­ened to human­i­ty’ and could care less killing off unwant­ed or leach­ing aspects of Amer­i­ca and the world. I swear to you, the major­i­ty of the pilots are like machines, I call them “Tanker Ter­mi­na­tors”. I should not be telling you this, but near­ly 1/3 of all flights are being orches­trat­ed from small unnamed islands, where new­ly con­struct­ed bases are being built at a rate of 8 per year. 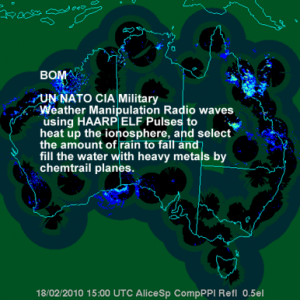 On these extreme­ly remote islands there are HAARP rays of every pos­si­ble design, with many arrays sur­round­ing these islands with­in the depths of the ocean itself. The Navy has devel­oped sophis­ti­cat­ed under­wa­ter con­struc­tion tech­nol­o­gy that allows ful­ly autonomous robot sub­mersibles to trav­el great dis­tances, and even man­u­fac­ture parts for these mas­sive under­wa­ter arrays as they progress across the open sea floor. Every time that you see or hear about mil­i­tary exer­cis­es at sea, they’re basi­cal­ly there to give sup­port and resup­ply their army of under­wa­ter robot­ic min­ions. 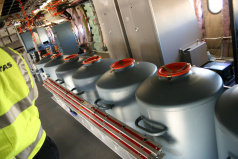 There is pos­si­bly one aquat­ic robot per plane, and will soon be dou­ble that. You will nev­er be able to Google Earth or Search any of this. Oth­er than an occa­sion­al error in blur­ring some island bases, or smudged images of under­wa­ter arrays, it is impos­si­ble to locate all these advanced tech­no­log­i­cal devices. They even paint fake clouds over some of our island instal­la­tions to keep pry­ing eyes away. I have been shown some of these images by civil­ian friends. That is the rea­son I know this. I com­plete­ly under­stand your con­cern for human safe­ty, and here is the kick­er. We are shown videos in our train­ing of cat­a­stroph­ic destruc­tion to our home­land by very sophis­ti­cat­ed weapons, then told that these will be the con­se­quences if we don’t fly. Our efforts in build­ing a defen­sive atmos­pher­ic weapon shield are the only mis­sions of its kind in the world. We are paid more than any oth­er pilot for our ser­vice, oth­er than Air Force One pilots who make as much or more and are kept in a dark, secret world for their own pro­tec­tion. They tell us that secre­cy is our pro­tec­tion, and not to lis­ten to any pub­lic rhetoric. We all know about cyber pro­gram flash-point or FP- 03 as it is known with­in the vet­er­an com­mu­ni­ty. This pro­gram is a self-destruct sequence that can be remote­ly acti­vat­ed from any ground, water sur­face, under­wa­ter base, as well as any oth­er air mobile unit. The sig­nal is encrypt­ed through three satel­lites and can­not be jammed or blocked. At any giv­en moment you could have only 15 sec­onds to make your peace with your God. They tell us that FP exists to keep planes from acci­den­tal­ly going down in heav­i­ly pop­u­lat­ed areas. They can remote­ly det­o­nate our planes over safe zones, but in the back of your minds, our minds, we’re pret­ty sure this is a fail-safe pro­gram to keep pilots from turn­ing over assets to any pub­lic, pri­vate, or civil­ian author­i­ties. Have you ever seen any mem­ber of the crew sur­vive the few crash­es that have occurred? Every plane that has gone down was com­plete­ly destroyed … for good rea­son, I am sure. We risk our lives in more ways than one, every sin­gle time we fly, espe­cial­ly dur­ing night flights. They are order­ing us to fly at low­er and low­er alti­tudes. We feel like a mas­sive “Dark Force Empire”of crop dusters, and know that one night Bub­ba, or Bil­ly Joel, will fire there long rifles at us when we spray their moon­shine-mak­ing oper­a­tion, or pass over an ille­gal Mary Jane crop. I know for a fact that some planes have been shot at, and sub­se­quent­ly brought down by most­ly Russ­ian, Chi­nese, and Kore­an weapon­ry, but the media will nev­er cov­er these events as they are not allowed to report on our flights either. That must be true, for I have yet to see a detailed or in lengthy report of our mis­sions on any pub­lic venue oth­er than con­spir­a­cy shows and anti-gov­ern­ment web­sites. I risk every­thing for dis­clos­ing so much infor­ma­tion and you will find very few like me. Even my own flight crew would have me arrest­ed and court mar­tialed if they knew of this dia­logue. That is why I can­not email you direct­ly, but from what your cousin tells me you are also risk­ing every­thing just to get this infor­ma­tion out to your col­leagues. I salute you sir, for stand­ing up to the estab­lish­ment and Big Broth­er. I would love to go home tomor­row and not rack up one more sin­gle minute of flight time, except for a sweet lit­tle Piper Cub, or Rat Tail Barn Rac­er. I miss those beau­ti­ful blue skies from my youth, and I am ashamed for haz­ing over that dream. More impor­tant­ly, maybe my fel­low pilots will read or hear about this, and decide to come for­ward as well. 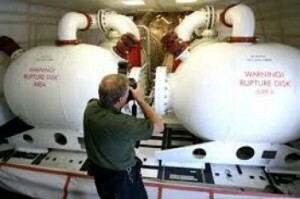 I only know a small frac­tion of the larg­er pic­ture, as they com­part­men­tal­ize every­thing. Should I become aware of any new sig­nif­i­cant devel­op­ments I will email your cousin. The man I have con­tact with says he sens­es a waver­ing with­in the ranks, and that a kind of mutiny is begin­ning to boil to the sur­face of this whole geo­engi­neer­ing glob­al white­wash­ing, if you catch my drift. My cousin still has friends in high places too, so he is help­ing to pro­tect the pilot. Those were his words, not the actu­al Air Force mes­sage. He want­ed me to stress that. 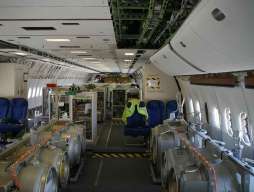 He believes that the focus of their flights will be moved to areas east of Cal­i­for­nia and Texas, in order to advance the drought fur­ther into the heart­land; plus, he feels that a very new and extreme­ly tox­ic chem­trail mix is going to be sprayed, using new tech­nol­o­gy that makes these spe­cial chem­trails com­plete­ly invis­i­ble. “Atmos­phere shield of pro­tec­tion”, he doesn’t believe that either. So that is the end of the mes­sage from this chem­trail pilot. From my own expe­ri­ence I’ve had a lot of con­tact with this guy for six months via the Inter­net, and basi­cal­ly every­thing he told me has turned out to be true, so I have no rea­son to doubt any of this, and hope you for­ward it. This also points out how dif­fi­cult it is to fight this pro­gram because peo­ple inside the pro­gram are not sub­ject to pub­lic opin­ion or exposed to pub­lic infor­ma­tion sources. There­fore, we need to brain­storm and come up with the way to shut down this pro­gram, as it is actu­al­ly heat­ing the plan­et, and killing every­thing with ele­vat­ed UV rays, and tox­ic met­als. 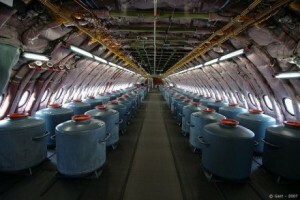 An active chem­trail pilot has quite coura­geous­ly stepped out of the shad­ows at great risk to his career and his life. Such a sac­ri­fice ought to com­pel the fast-grow­ing com­mu­ni­ty of anti-chem­trail advo­cates to dis­sem­i­nate his much need­ed mes­sage. 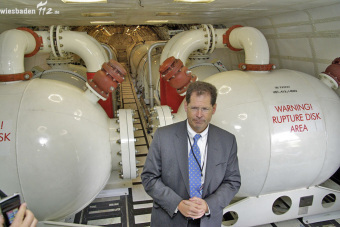 Rais­ing the world­wide aware­ness around this pilot’s unprece­dent­ed dis­clo­sures seems essen­tial toward shut­ting down the cur­rent form of glob­al geo­engi­neer­ing. Oper­a­tion Indi­go Sky­fold has been OUTED. We now know its name. We now know how it works. We have been informed that it is being expand­ed in 2015 and is now more dan­ger­ous than ever. 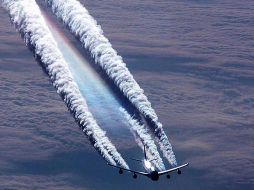 You must under­stand also that you can mit­i­gate the effects of chem­trails, i.e. all chem­i­cals delib­er­ate­ly mixed into the air you breathe or even in the food you eat, with a very sim­ple off-the-shelf appli­ance. Find more about it here. Novem­ber 1, 2014 by Arjun Walia One fac­tor that’s com­mon­ly over­looked when it comes to talk­ing about human health and envi­ron­men­tal degra­da­tion is geo-engi­neer­ing and Solar Radi­a­tion Man­age­ment (SRM), also known as “chem­trails.” The name seems to come from the fact that var­i­ous geo-engi­neer­ing and SRM pro­grams use stratos­pher­ic aerosols like bar­i­um, nano alu­minum-coat­ed fiber­glass [known as CHAFF], radioac­tive tho­ri­um, cad­mi­um, chromi­um, nick­el, des­ic­cat­ed blood, mold spores, yel­low fun­gal myco­tox­ins, eth­yl­ene dibro­mide, poly­mer fibers and more. Below is a video of mul­ti­ple sci­en­tists, doc­tors and pilots telling the truth about “chem­trails.” It’s a very seri­ous issue that’s often ridiculed and thrown into the con­spir­a­cy realm. As a result I attached infor­ma­tion from an arti­cle I recent­ly wrote about the sub­ject. Ques­tion: Have you noticed that 2015 has seen more spray­ing than ever — EVERYWHERE? 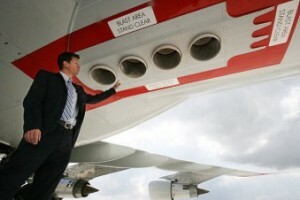 It’s true, the chem­trail­ing is now total­ly out of con­trol. It has nev­er been so impor­tant to post infor­ma­tion like this on health blogs, envi­ron­men­tal web­sites, social net­works, alter­na­tive news sites, videos, and every­where chem­trails are men­tioned in order to broad­en as many peo­ples’ aware­ness as pos­si­ble! The ongo­ing envi­ron­men­tal dis­as­ter and health cat­a­stro­phe caused by chem­trails presents a great oppor­tu­ni­ty for peo­ple of all races and reli­gions, nation­al­i­ties and soci­eties to unite, and coop­er­ate, around the pro­tec­tion of human­i­ty and the preser­va­tion of the Bios­phere. Just click on those links for relat­ed arti­cles towards achiev­ing those ends.